I've waited a long time to taste this Toshan, because I was unable to find anything good written about this one. But I'm a Toshan man, so I cannot put it off forever, right? Now, wine finishes are always tricky, but the Auchentoshan 1988 Bordeaux Wine Finish was a bull's eye, so this one cannot be all that bad, can it? Surely not. I think. I hope. Anyway... 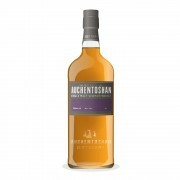 This Auchentoshan is 18 years old, distilled in 1991 and finished on a red wine cask of Chateau Montrose, a French Bordeaux wine from the Haute Médoc region. The nose is a battle between sweet and sour. After a few minutes, sour wins flat out. The wine influence is very clear and over the top. This is a good (or should I say 'bad') example of a vinous whisky. It develops a little more in the glass, but unfortunately it's going the wrong way. Sulfer is an off note in this one. Rotten eggs are not far off. Pity. It's quite oily in the mouth, but also very spicy (I'm sure the 59,3% ABV has a lot to do with that). I get some grapefruit, rather a-typical for Auchentoshan. I also get some dades, raisins and towards the end some orange peel. It becomes quite bitter. The finish is medium in length with oranges and a bitterness that makes you reach for a glass of water. This burning Auchentoshan is a let down. The black sheep of the otherwise so delicate Auchentoshan family. It's hard to get at this point, but that's a plus, I guess.